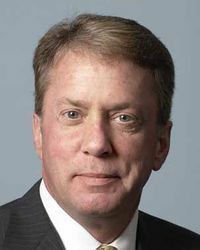 Terrence A. Duffy is the chairman and chief executive officer of the CME Group. He took over that role when Phupinder Gill retired as CEO at the end of 2016. Duffy oversaw the CME Group's adoption of the exchange's first bitcoin futures trading, which began in December 2017. He stated that this decision was in part due to "increasing client interest in the evolving cryptocurrency markets." Terrence Duffy doesn't own any bitcoin or cryptocurrency, but has stated that he believes that the CME Group is taking "a very measured approach" so it doesn't "miss potentially helping something that could change the world." In March 2019, Duffy told Business Insider that the finite supply of bitcoin is the greatest factor keeping governments from using it. "The governments can't run unless they can run on a deficit...I am trying to figure out why they would say, 'Sounds good to me because I want to be responsible and run everything an [an] even-for-even basis. I can't borrow against anything.'" He explained that since governments can't print bitcoin at will in the same way they do national currency, it does not fit well in modern economic theories. He also said that regulatory approval is the only way that bitcoin will gain adoption on Wall Street. To read the full article on Terrence A. Duffy, click on to open a new tab with MarketsWiki. ↑ CME Group CEO to retire. Crain's Chicago Business. ↑ The biggest exchange group in the world is unexpectedly gatecrashing the bitcoin business. Business Insider. ↑ CME CEO Terry Duffy doesn't own bitcoin, but says it might change the world. CNBC. ↑ Bitcoin Futures Kingpin Reveals Why Regulators Hate Crypto. CCN. This page was last edited on 27 March 2019, at 09:41.